Fiordland Helicopters provide charter helicopter track access to the Dusky, George Sound and Kepler (Luxmore Hut) walking tracks in Fiordland National Park. We can provide both one way or return flights, allowing you to experience the track highlights or gain access to some of Fiordland’s most remote and spectacular areas. 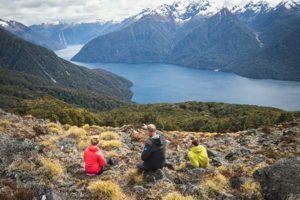 By chartering with us, you can also add on a flyover of Milford or Doubtful Sound, or choose one of our exclusive packages, such as the Guided Milford Day Walk. "I would urge anyone that is looking to tick this activity off their bucket list to do so with Fiordland Helicopters"
"Our pilot Kim was knowledgeable and passionate about the fiords. We flew over Doubtful and Dusky Sound. We were just totally overwhelmed by how stunning it was!" "My husband and I flew over Doubtful and Dusky Sound. A couple of stops along the way for photos. Two Hours. Worth every cent!" "They were extremely flexible when we wanted to change dates and times due to weather. Highly recommend this company."